The Fellowes Powershred® 90S strip-cut shredder is an intuitive shredder that delivers outstanding performance. Suitable for 1 – 3 users, this paper shredder is an ideal solution for personal use as well as small office use. Creating strip cut particles of 7/32”, the Powershred 90S shredder offers a security level P-2. It can successfully shred 18 sheets per pass, allowing the user to destroy letters, bills etc. without a hassle. Furthermore, the 90S strip cut shredder has an auto reverse feature. This feature ensures to reverse the shredding process in order to avoid paper jams. 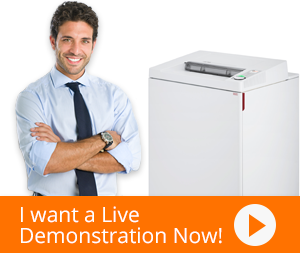 The SilentShred feature also plays a vital role in making this shredder a premium solution. Due to SilentShred, the shredder makes no noise during the shredding process. This allows the user to obtain work place silence. The 9-gallon pull-out bin can be empties effortlessly as and when needed. The Fellowes Powershred® 90S strip-cut shredder is a unique blend of efficiency and convenience and is surely the most feasible choice. Q. What’s the best feature of the Powershred 90s strip cut shredder? A. The Powershred 90s strip cut shredder is efficient and built to be such. It can run nonstop for 25 minutes in a single go. Q. How many sheets can I shred at a time? A. At one time, you can insert 18 sheets into the Powershred 90s strip cut shredder. Q. Does the bin come with a bag? A. Yes, the Powershred 90s strip cut shredder comes with a bag, which makes disposing the shredded waste very convenient and hassle-free. Q. What happens when paper gets jammed? A. The Powershred 90s strip cut shredder has anti-jam features, which means zero chance of paper jams. Q. Is it easily portable? A. Yes, the machine weighs only 16 kilograms and users can move it around by a single person. A. No. The Powershred 90s shredder will go into standby mode when not in use to help you save energy. Q. Can I use it for my home office? A. That depends on the volume of shredding you need. The design of the Powershred 90s is ideal for heavy shredding.